Banana bread sounds good in theory right? It’s fruit – it must be healthy. Nope, sorry. Most banana breads that you find in cafes are pretty well just glorified cake …. don’t get me wrong – they are super delicious, but just not a very healthy choice! This recipe is a lot lower in sugar and has lot of extra goodies added to it. Still super delicious, but I am really happy to pop this one in lunch-boxes or enjoy at brunch or with an afternoon cuppa. If you are after a more traditional version of banana bread, Lib has also posted a yummy banana bread recipe. See below the recipe for a coeliac friendly option. Into a large bowl add all of the dry ingredients. I don’t do sifting (ever if at all possible! ), so I use a whisk to gently mix this dry mixture until it’s even. In a large measuring jug, mix the milk and the vinegar and whisk vigorously for a minute. It should become slightly thicker and have lots of frothy bubbles on top. Then set aside for a few (3-4) minutes. Or blitz in your blender/nutribullet for a few seconds. Add the wet ingredients to the dry, folding them in until just combined – don’t over mix. Pour into a large greased loaf pan, sprinkle oats on top and bake at 180C for about an hour, or until a skewer, inserted in the middle comes out clean. Allow to cool in the tin for 10 minutes before transferring to a wire rack for another 10-15 minutes. I also make these into muffins when I don’t have as much baking time – makes 18-20. This is yummy as is, or with a bit of Nuttelex, or even toasted. It freezes and defrosts well, just slice and wrap individually before freezing. 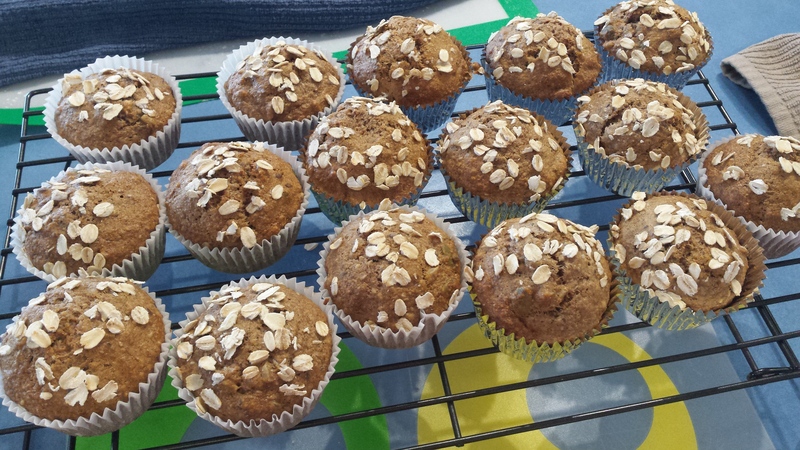 To make these coeliac friendly, use 1 2/3 cups of GF flour mix (I like Bobs Red Mill All purpose baking flour) plus 2 flat tsp of psyllium and make sure you use a gluten free milk then top with rolled quinoa. Whisk the milk and vinegar and set aside (Speed 4, 10 seconds). Place the bananas, oil, vanilla, aquafaba/egg and syrup in the bowl and process on speed 5 for 8 seconds. Add in milk mixture and process on speed 4 for 8 seconds. Then set aside the wet mix. Add all of the dry ingredients to the machine and process on speed 4 for 8 seconds. Add the wet mix back into the dry and process on speed 4 for 6 seconds, the scrape down and repeat. Bake as per regular method. Glad you like the site. Sorry if you’ve had difficulty with some of the spelling. I wonder if you realise that I’m in Australia so we often have different spelling to other English speaking countries? I do my best and hope it will be helpful.